One question I hear from time to time from Omniture SiteCatalyst users is: “What are the paths visitors take on my site when they are successful in reaching one of my desired Success Events?” Basically, on most websites, there are a few ideal paths that you wish all visitors would take. Unfortunately, most visitors don’t adhere to your ideal path so you need to see what paths they are choosing to take. 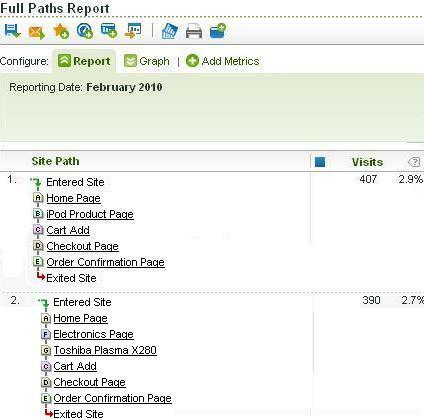 Of course, you can use Pathing reports to see all of the paths that visitors are taking, but that can be very cluttered and hide what is really happening related to Success Events. Therefore, one interesting analysis you can do is to focus only on paths that do lead to success. I equate this to the old “cow path” story where architects would wait to create sidewalks in front of new buildings to see where people naturally walked and then build the sidewalks where people are already going. In this post I will show you how you can do this in SiteCatalyst. But I Don’t Have Discover or Insight? When I raise this topic, the first thing people say is that they can’t do this because they don’t have Omniture Discover or Omniture Insight. While those products are great and I highly recommend them, the good news here is that you don’t need those tools to see the paths that lead to success. In fact, due to a current Discover limitation (more info on this later on), you cannot do this analysis in Discover, but you can do it easily in Omniture Insight. The one thing you will need to perform this analysis, however, is Advanced Segment Insight (ASI). The key to this solution is the Full Paths report in SiteCatalyst. Normally, this report is a tad boring since there are so many unique paths on a site that beyond ENTER>>HOME PAGE>>EXIT, the rest of the percentages are usually pretty slim (i.e. .1% of all paths). However, if you could look at this report for a small subset of your website audience, the percentages should go up dramatically. This can be done with ASI, where you create an entire new data set for a specific segment. Once you have created your segment and run your ASI slot, you have access to all SiteCatalyst reports, including the Full Paths report. Hence, all you need to do is to properly identify a segment containing a Success Event, run your ASI slot and then look at the Full Paths report. Just remember the formula. Create segment, run ASI, look at Full Paths (Repeat). The possibilities are only limited by your imagination. I usually look at the top five paths for a bunch of different segments and then compare them to see what is common between them. As I mentioned earlier, it would be much easier to do this analysis in Discover (where segmentation is instantaneous), but currently, there is no Full Paths report in Discover (see my idea suggestion and feel free to vote for it!). I hope that gets into the product since then you wouldn’t have to wait a few days each time for the ASI slots to process. Well…there you have it, a quick and dirty way to see which paths lead to success (or failure). Enjoy!